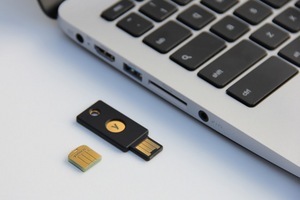 PALO ALTO, CA--(Marketwired - Apr 16, 2015) - Yubico, the leading provider of simple and open online identity protection, today announced the launch of the YubiKey Edge, cost effective, one-touch strong authentication devices that protect against web-based threats to keep online identities safe. YubiKey Edge, which comes in both the Standard and Nano (Edge-n) formats, supports the two most used YubiKey protocols -- One-Time Password (OTP) and U2F. Highly requested by Yubico partners and customers, YubiKey Edge combines multiple authentication options. YubiKey Edge incorporates OTP authentication which is the foundation of YubiKeys, including YubiKey OTP, OATH, and Challenge-Response. Added support for the FIDO Alliance's Universal 2nd Factor (U2F) protocol, provides easy-to-use public key cryptography. "Two-factor authentication has become a must-have defense for protecting users, applications and accounts from the daily epidemic of hacks and password theft," said Stina Ehrensvard, CEO and Founder, Yubico. "YubiKey Edge uniquely combines driverless OTP, for today's strong authentication infrastructure, with the emerging standard FIDO U2F, providing public key crypto and protection against man-in-the-middle attacks." U2F functionality within YubiKey Edge works via the browser, with Google Chrome offering initial support and Mozilla's Firefox under development. Gmail and other applications such as WordPress are supported, and additional U2F-compliant apps and services are in development by various vendors for future interoperability. Multiple OTP configurations: including YubiKey OTP, OATH, Challenge-Response; U2F enabled alongside OTP mode. As the inventors of the YubiKey®, Yubico sets new world standards for secure login across the Internet. Our unique USB and NFC key offers one-touch strong authentication supporting multiple authentication protocols for all devices and platforms -- with no driver or client software needed. With successful enterprise deployments in 140 countries, including 7 of the top 10 Internet companies, Yubico is adding the consumer market to its list of strong authentication converts. Founded in 2007, Yubico is privately held with offices in Palo Alto, Calif., Stockholm, and London. For more information, please visit www.yubico.com. YubiKey Edge, which comes in both the Standard and Nano (Edge-n) formats, supports the two most used YubiKey protocols -- One-Time Password (OTP) and U2F.